In this post I will be doing a Liquid Grip review, a very popular gym tool! Liquid Grip is a brand of liquid chalk, and can be very useful, especially for certain situations. I know at my gym, powdered chalk is frowned upon as it is a commercial one, so Liquid Grip is perfect! I also find it to have many benefits to it as well over regular chalk which I will get into as this article progresses. I will be including a product overview, durability rating, performance rating, and appearance rating as well as a closing opinion. Let’s get on with the article! As with any product, durability is the most important thing, a product that performs is no good and definitely not worth the money if it doesn’t last. Now although this isn’t a traditional “object” type product, I will still be rating its durability, however it will more so be in the form of its quality and other characteristics. Let’s first start with the bottle. Although not super important, you don’t want it to be cracking. It is of fine quality and structure that it will stay intact and withstand any drop that it would realistically come across. 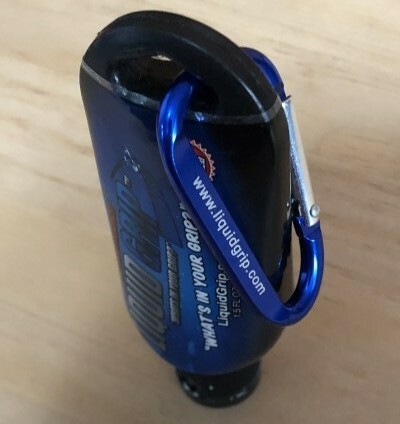 In the 1.5 ounce bottle, a carabiner is attached to the bottle and that has good quality as well. Now onto the good stuff, the actual product. I would describe it as a thin cream like liquid that is smooth and easy to spread across your hands. I am no scientist so I do not know how the ingredients are supposed to react, however I can say it never has any lumps in it, and it stays the same consistency over time. I have had a bottle for 6+ months and nothing changed, which is really good! So, although I cannot say the ingredients are good quality as I don’t know anything about them, I can say the overall product is of awesome quality! Because of the solid construction of the bottle, the thin, smooth and consistent characteristics of the liquid, I can say this product deserves a 10/10 on quality. It lasts for long periods of time as well, which is why there really isn’t any room for improvement from the Liquid Grip company. Now it is time to get into the meat and potatoes of any product, does it actually work? No one wants to spend their valuable dollars on products that don’t give them any benefit, no matter how good the quality is. Using Liquid Grip for around a year know, I can comfortably tell you just how well it works. We first need to understand what the role of any product is before I can give my opinion on whether or not it works. With a liquid chalk, it is meant to give you much better grip. This not only gives a much more secure grasp on the bar, but also reduces wear on your hands, (don’t worry you still get your calluses for extra grip, haha). Another job of liquid chalk is to prevent mess. Chalk in general has one more rather important job as well which is, keeping yours hands dry from sweat. Time to find out if Liquid Grip does just this. I find Liquid Grip to give me an extremely firm grip on the bar, I notice a huge difference between no chalk and even traditional powdery chalk. The other bonus to this is once I have applied it, it fully dries within 30 seconds, even less if I wave my hands through the air. As far as the job of reducing mess goes, it does this wonderfully. The only mess that arises from using this chalk is some of it gets rubbed of on the barbell, not much though, or the odd flake will fall from the dried chalk on the cap. Other than that, when applying the chalk it goes straight onto my hands, dries quickly and leaves no mess whatsoever. I have used both traditional and liquid chalk before and I must say that traditional chalk does a better job of keeping your hands dry, however, it is marginal. I would give Liquid Grip chalk an overall rating of 9/10 for performance. It does an extremely good job of keeping your grip secure on the bar, while reducing mess. The only reason it did not receive a perfect score is because its slight lack of ability to keep your hands dry. Liquid Grip performs very well overall! I know what your probably thinking, what does appearance have to do with chalk? Well I will first talk about the appearance of the bottle, although not largely important it does help a bit. I will also be talking about how the chalks looks, but more so its smell as that is quite important, especially if training at a commercial gym. Talking about the bottle first, there really isn’t anything too special. It uses a gradient blue that pops, with other shades of blue, as well as red and silver for words. The label is wrapped tightly. All in all, the label is well-designed and looks clean. Now onto the liquid itself, which is a consistent creamy colour. It has a wet paint smell, but not a bad kind. You would think it has chemicals based of its smell, however, it is said to be “100% natural and biodegradable”, on Liquid Grips website. 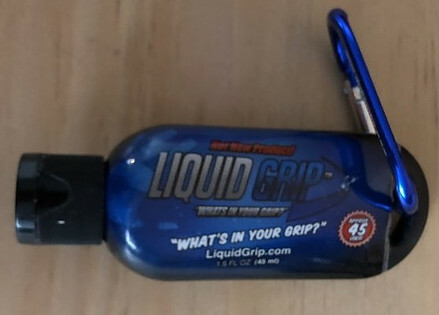 All in all I would give liquid grip a 9/10 on its appearance. The bottle looks fine, but it doesn’t feature anything special and I am sure it could be done better. The product looks normal but doesn’t smell great, it’s not bad either though; It has a unique smell that isn’t bothersome. Overall, there wasn’t anything special but it would be tough to ask for too much more from this product. All in all, Liquid Grip is an awesome product that does a great job of securing your grip while leaving no mess. It could use some work on keeping your hands dry. The smell isn’t the greatest, but it is alright. The looks of the label is the last thing that could use some work, however, it isn’t too bad and it also isn’t very important. I thank you for reading my article and look forward to Liquid Grip being able to benefit you in your training! As always, if you have any questions or comments, please do not hesitate to leave them below and I will be sure to reply! Hi Michelle, the ingredients say: Alchohol, Magnesium Carbonate, Thickener, Fragrance. I don’t see parabens unless it is in one of the ingredients. I don’t know much about the ingredients of this product though, so I cannot say anything about them for certain. My son-in-law works out a lot at the gym, and since his birthday is coming up, I wanted to give him a couple of things that he could use. I know that his gym doesn’t allow the chalk, so this would be something he’d really like I think. If I bought him one bottle, how long do you think it would last for someone who goes to the gym about 3 times a week? Hi Janelle, this product sounds perfect for your son-in-law, I am sure he would love it! 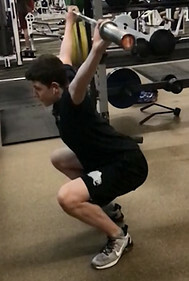 As for your question, it depends on what type of exercises he does. If he does lots of grip intensive exercises the bottle would go quicker then if they were done less frequently. However, thinking of a typical training plan, it would likely last around 3-6 months. The 1.5 oz bottle has about 40-45 portions in it, although you can get an 8oz bottle or a combo pack as well. My 1.5 oz bottles last around 4 months personally, and I use Liquid Grip a fair bit. Hope that helps! I have never used this stuff although I know of it. My gym loves on chalk with 3 chalk buckets around. You say it takes about 30 seconds to dry and be useable? If that is true it won’t work for me in my Crossfit gym where it is all about time. I might be interested in this for when I do open gym just lifting. I see it would work if you have the time to wait if that’s true. Ah yes, I can see your gym allowing powdered chalk seeing as it is a CrossFit gym. If you applied it before your workout in an ample amount, I believe it would last for the duration of your workout, then there is no time issue. The again, this works for me and I do not do CrossFit, so you would have to see if it would work for your workouts. I love that this is an alternative to traditional powder chalk, as that can tend to be messy and airborne. I know several power lifters that would probably benefit from this product. Can you tell me how fast you typically go through a bottle? And also, do you have to reapply if doing an extra long workout (ie: 2-3 hours)? A bottle typically lasts me around 4 months, however, keep in mind I only use mine about twice a week. As other workouts I do not need to use it. If it is a really grip intensive workout, then you may need to reapply. Applying an ample amount at the beginning of the workout would help with this though. I always thought that in order to avoid your hands from slipping you needed to wear some kind of gloves! I do have a few questions concerning liquid-grip. In your review, you mentioned that the product doesn’t keep your hand completely dry, so if you sweat a lot is it worth it to use liquid-grip instead of the powdered chalk? Also, how long does liquid-grip last before you need to reapply, is the traditional chalk last longer when compared to Liquid-grip? Nope, that is not the case. I had used gloves when I was starting out, and actually noticed it was harder to grip because of the material of my particular gloves. If you sweat a lot, maybe powder chalk would be best, or just making sure you are trying to wipe your hands and keep them dry. Liquid Grip will keep your hands dry, but at a certain level of sweat you may notice some sweat start to be apparent.